A Heart Stopping Awful Mum Moment. | Life Love and Hiccups: A Heart Stopping Awful Mum Moment. I had my first heart stopping moment as a soccer mum this past weekend. Except my heart didn’t actually stop, it more kinda pushed its way up to my ears and started pumping all beserko in my head and oh yeah I was at Rugby and not soccer when it happened. 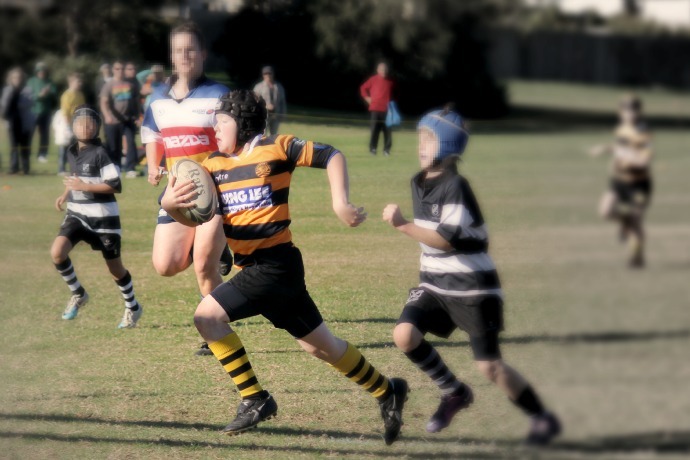 My oldest son made the move from Soccer to Rugby Union last year, much to my hubby's delight and to my horror. Don’t get me wrong, I like Rugby... about as much as I like any of those kind of sports. In fact it’s actually a pretty classy game as far as any game that involves throwing a ball around a field and shoving each others face into the dirt goes. It's even almost interesting to watch - not that I for one minute will pretend to know what the hell is going on out there. Its just that I would probably like Rugby more if my baby was not in the front row being crushed underneath a pack of testosterone raging youths. Bahaha Who am I trying to kid, I am SO one of those mums! Why I even went so far as to abuse my power once when I was on BBQ duty at one of the boys soccer games. A kid from the other team had mouthed off at one of my sons and when that kid turned up to the BBQ where I was holding fort with a pair of tongs, justice was mine. His grubby hands shoved two pieces of bread towards me and without a single please or even hint of manners, he demanded a bacon and egg sandwich. Well can I tell you, that kid certainly got his bacon and egg sandwich. It just happened to be the crispiest, most well done (aka severely burnt) scraps of bacon and egg that I could find from the rejection pile on the side of the BBQ, kind of bacon and egg sandwich. Cause I’m nice like that and clearly I am very mature too! Back to my story, which I do apologise for taking such an awfully long time to get to. So the game was in full swing and I was sitting on the sidelines with some friends who also have kids in the team, and we were chatting away all the whilst keeping one eye permanently on the action . I heard some of the other parents go “oooohhhh” you know in that low voiced, scrunch your nose up and buck your teeth, grimacing kind of way (you totally just pulled that face didn't you?). I stopped the conversation dead and turned my attention to the poor kid lying on the field. When he didn't get straight up we all held our breath and watched and waited and willed as his team mates stood over him. Holy crap that IS my son, I realised as my head began to spin. When he finally stood up I began to breathe again but my eyes did not move from him as he stumbled off the field holding his head. When his team manager put her arms up in the air to signal something, (something that I had no idea what is was being the complete Rugby ignorama that I am) I began to panic a little. OK I panicked a LOT! I looked on from across the field as my son was laid down on the ground, his legs were stretched out and something was put onto his head. Somebody said to me “Sonia, I think he is really hurt”. I don’t know who said what to me, it didn’t really matter as everyone was suddenly speaking alien. All I knew was that there was a bloody big football field between me and my child and I needed to get to him, like RIGHT NOW. And so I did something that I have not done in the 8 years since my accident. OK I more stumbled really. I part ran, mostly awkwardly tripped with the sole purpose of getting to my boy as soon as was humanly possible. One of my friends ran ahead of me so she could tell him I was coming and I have never been more grateful for someone being able to run faster than me in my whole life. I literally wet my pants as I ran and although I would like to say it was out of fear and panic, the truth be told after having not run for 8 years I had no idea how weak my pelvic floor muscles are. Thankfully when I reached him, he was OK. Overwhelmed and sporting a very big headache, but OK.
His gorgeous team manager had laid him down to catch his breath and have a moment to himself to recover away from the eyes of his team mates and the opposition. Suddenly my big boofy boy reminded me of the shy sick little boy he used to be and the mother in me began to shake and cry with relief that he was OK. Through my tears I tried to tell him off for scaring the bejeezus out of me, but all I really wanted to do was hug him and take him home. We didn't go home and I didn't humiliate him by throwing myself all over him in front of his team mates, and after a little while he rose to his feet and went back on the field and played his heart out. Meanwhile I sat on the sidelines and took a mental photograph of the faces of every kid on the opposing team. I was on BBQ duty that day. You don't need to be Einstein to work out the rest of this story. I'll most likely be relegated to the canteen from now on. Are you a Sideline Helicopter Mum? Are you tempted to run out onto the field and defend your child? A Huge Mother's Day Giveaway - Winner Takes All!